What makes an icon? When it comes to yacht interiors, it might not always be what you’d expect. There are the obvious head-turners and there are the yachts that stand the test of time. Among all these we find the rare icons, the ones that set the bar, that broke the mould, that tested new ground. Some of these hold up today, while some we look back on with a what-were-they-thinking arch of an eyebrow, but there is no denying they define an era. From glamorous to garish and daring to boldly discreet, each of these yachts is a symbol of their time. Delphine Built for automobile pioneer Horace Dodge and named after his daughter, Delphine was America’s largest steamship yacht, at 78.5 metres. She defined early 1920s glamour, with a smoking lounge and a pipe organ for entertainment in an interior that made her suitable as the flagship for Admiral Ernest King, commander in chief of the US Fleet during the Second World War. Delphine is also an icon of restoration. She caught fire and sank in New York in 1926 and the family salvaged and restored her to as-new condition. She then ran aground in 1940 and was repaired. Finally, in 1997, she was sold for scrap and underwent a six-year, $60 million restoration, pictured here. Today she’s the only yacht of the era with her original steam engines in service. What makes an icon? When it comes to yacht interiors, it might not always be what you’d expect. There are the obvious head-turners and there are the yachts that stand the test of time. Among all these we find the rare icons, the ones that set the bar, that broke the mould, that tested new ground. Some of these hold up today, while some we look back on with a what-were-they-thinking arch of an eyebrow, but there is no denying they define an era. From glamorous to garish and daring to boldly discreet, each of these yachts is a symbol of their time. Built for automobile pioneer Horace Dodge and named after his daughter, Delphine was America’s largest steamship yacht, at 78.5 metres. She defined early 1920s glamour, with a smoking lounge and a pipe organ for entertainment in an interior that made her suitable as the flagship for Admiral Ernest King, commander in chief of the US Fleet during the Second World War. Delphine is also an icon of restoration. She caught fire and sank in New York in 1926 and the family salvaged and restored her to as-new condition. She then ran aground in 1940 and was repaired. Finally, in 1997, she was sold for scrap and underwent a six-year, $60 million restoration, pictured here. Today she’s the only yacht of the era with her original steam engines in service. Talitha is a 82.6 metre motor yacht, designed by Cox & Stevens, and has had many owners and many lives. After she was purchased by Paul Getty in 1988, a full refit was undertaken at Devonport Yachts in 1993, led by the legendary Jon Bannenberg, and updated in 2009. He was inspired by the original art deco interior, and his refit aimed to recreate elements of it while bringing her into modernity. What makes Talitha really stand out is the painstaking recreation of original parts with modern functions such as her on board telephones. Talitha is a 82.6 metre motor yacht, designed by Cox & Stevens, and has had many owners and many lives. After she was purchased by Paul Getty in 1988, a full refit was undertaken at Devonport Yachts in 1993, led by the legendary Jon Bannenberg, and updated in 2009. He was inspired by the original art deco interior, and his refit aimed to recreate elements of it while bringing her into modernity. What makes Talitha really stand out is the painstaking recreation of original parts with modern functions such as her on board telephones. Although commissioned and launched as a private yacht for financier Sewel Avery in the 1930s, it was her rebirth as the US presidential yacht that made her name. She served five presidents – Truman, Eisenhower, Kennedy, Johnson and Nixon, making her the longest serving US Presidential yacht – but was best regarded for the time she served President Kennedy, who renamed her Honey Fitz after his grandfather. The 28.35 metre yacht took interiors to a new level in the early 1960s when First Lady Jacqueline Kennedy helmed her refit (pictured). Mid-century furnishings and details were added to suit a family – and president – at sea, including a colour TV in the saloon. Her current refit, carried out by Moores Marine, upholds this mid-century styling. Although commissioned and launched as a private yacht for financier Sewel Avery in the 1930s, it was her rebirth as the US presidential yacht that made her name. She served five presidents – Truman, Eisenhower, Kennedy, Johnson and Nixon, making her the longest serving US Presidential yacht – but was best regarded for the time she served President Kennedy, who renamed her Honey Fitz after his grandfather. The 28.35 metre yacht took interiors to a new level in the early 1960s when First Lady Jacqueline Kennedy helmed her refit (pictured). Mid-century furnishings and details were added to suit a family – and president – at sea, including a colour TV in the saloon. 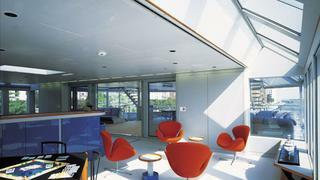 Her current refit, carried out by Moores Marine, upholds this mid-century styling. After serving as a surplus naval vessel in the Second World War, Greek ship owner Aristotle Onassis converted Christina O into a superyacht. It was an era when the golden age of Hollywood was recreated in interior design, and Christina O reflected this, with formal bedrooms and stylised living areas. The original features of this 99.15 metre classic are well preserved – the famous Ari’s Bar is made of timber from a sunken Spanish galleon and has orca whales’ teeth to hold handbags. The updated cabins are named after Greek islands and adorned in a pastel colour scheme, selected by Jackie O. She hosted the Hollywood and political elite: Marilyn Monroe, Frank Sinatra, Winston Churchill, JFK, Rudolf Nureyev… it’s a guest list as famous as they come. After serving as a surplus naval vessel in the Second World War, Greek ship owner Aristotle Onassis converted Christina O into a superyacht. It was an era when the golden age of Hollywood was recreated in interior design, and Christina O reflected this, with formal bedrooms and stylised living areas. The original features of this 99.15 metre classic are well preserved – the famous Ari’s Bar is made of timber from a sunken Spanish galleon and has orca whales’ teeth to hold handbags. The updated cabins are named after Greek islands and adorned in a pastel colour scheme, selected by Jackie O. She hosted the Hollywood and political elite: Marilyn Monroe, Frank Sinatra, Winston Churchill, JFK, Rudolf Nureyev… it’s a guest list as famous as they come. She was designed by Jack Hargrave for Ogden Phipps, the owner/breeder of a string of famous thoroughbreds including Buckpasser, the boat’s original name. A true style icon of the Seventies, Buckpasser featured avocado green carpets and bedspreads that matched the wallpaper. Later updated by American celebrity Frances Langford under the name Chanticleer, the yacht was then used to transport her and husband Ralph Evinrude (the outboard engine king) between their Canadian summer home and Florida. During her ownership Chanticleer was redecorated in shades of pink, given a cockpit for fishing and the three small round portholes lighting the passage to the forward dining room were converted into vertical ovals – a shape now the norm but then very much ahead of its time. She was designed by Jack Hargrave for Ogden Phipps, the owner/breeder of a string of famous thoroughbreds including Buckpasser, the boat’s original name. A true style icon of the Seventies, Buckpasser featured avocado green carpets and bedspreads that matched the wallpaper. Later updated by American celebrity Frances Langford under the name Chanticleer, the yacht was then used to transport her and husband Ralph Evinrude (the outboard engine king) between their Canadian summer home and Florida. During her ownership Chanticleer was redecorated in shades of pink, given a cockpit for fishing and the three small round portholes lighting the passage to the forward dining room were converted into vertical ovals – a shape now the norm but then very much ahead of its time. Today, copious amounts of glazing is de rigueur, but it wasn’t always the way. A trailblazer in the arena of floor-to-ceiling, back-to-back windows, Azzurra II, designed by Gerhard Gilgenast, was truly pioneering. The 47.5 metre superyacht’s upper deck master suite has 21 large windows boasting panoramic views, while floor-to-ceiling windows in the upper saloon bring in huge amounts of light. This gave a stunning spaciousness to the cream coloured, white leather interior, with a fittingly 1980s mirrored ceiling, which helped to open the space further. It was a breakthrough boat for interior designer Paola Smith and its high-glam interior style, with gold and lacquered furniture, defined styling for a decade. Today, copious amounts of glazing is de rigueur, but it wasn’t always the way. A trailblazer in the arena of floor-to-ceiling, back-to-back windows, Azzurra II, designed by Gerhard Gilgenast, was truly pioneering. The 47.5 metre superyacht’s upper deck master suite has 21 large windows boasting panoramic views, while floor-to-ceiling windows in the upper saloon bring in huge amounts of light. This gave a stunning spaciousness to the cream coloured, white leather interior, with a fittingly 1980s mirrored ceiling, which helped to open the space further. It was a breakthrough boat for interior designer Paola Smith and its high-glam interior style, with gold and lacquered furniture, defined styling for a decade. A design ethos of understated beauty is what made this 72.5 metre yacht, launched as Coral Island, stand out. Interiors were by Jon Bannenberg to an owner’s brief that specifically forbade opulent marble, gold or bling. Coral Ocean is credited as one of the first yachts to have this “casual elegant” motif, which is highlighted by myriad tribal details and African art and distressed furniture surfaces. It also featured a two-level master suite with a walk-in shower that begins on one deck and ends on another. While Coral Island was seen by only a handful of people until recently, enough details leaked out over the years to influence others in the style that has become today’s “beach chic”. A design ethos of understated beauty is what made this 72.5 metre yacht, launched as Coral Island, stand out. Interiors were by Jon Bannenberg to an owner’s brief that specifically forbade opulent marble, gold or bling. Coral Ocean is credited as one of the first yachts to have this “casual elegant” motif, which is highlighted by myriad tribal details and African art and distressed furniture surfaces. It also featured a two-level master suite with a walk-in shower that begins on one deck and ends on another. While Coral Island was seen by only a handful of people until recently, enough details leaked out over the years to influence others in the style that has become today’s “beach chic”. One of the most transformative yacht rebuilds ever completed, Dennis Washington saw the Japanese yacht Evergreen gutted to make way for a blank canvas with more than 2,300 square metres of interior space on which to create a dream interior and an unrivalled spa. 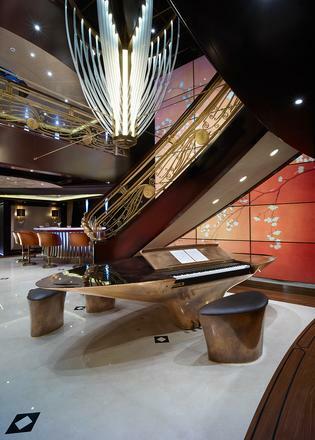 The 100.9 metre Attessa IV is known for her grand, gold-embellished staircase, spiralling through five decks, and a showstopper of a lobby featuring Botero sculptures. But what is perhaps most iconic is the blend of modern shapes with antique furnishings and fixtures. A massive glass dome in the upper saloon was created specifically to showcase an enormous Chihuly chandelier, while romantic 19th century fireplaces and evocative authentic art deco pieces, most sourced by the owners, fill the saloons and cabins of this family boat. One of the most transformative yacht rebuilds ever completed, Dennis Washington saw the Japanese yacht Evergreen gutted to make way for a blank canvas with more than 2,300 square metres of interior space on which to create a dream interior and an unrivalled spa. The 100.9 metre Attessa IV is known for her grand, gold-embellished staircase, spiralling through five decks, and a showstopper of a lobby featuring Botero sculptures. But what is perhaps most iconic is the blend of modern shapes with antique furnishings and fixtures. A massive glass dome in the upper saloon was created specifically to showcase an enormous Chihuly chandelier, while romantic 19th century fireplaces and evocative authentic art deco pieces, most sourced by the owners, fill the saloons and cabins of this family boat. A stark, militaristic exterior – trailblazing in itself – required a clean yet bold interior design. Marco Zanini created a Bauhaus-inspired interior for 70.7 metre Skat that called for simplicity, so its design eschewed clutter and superfluous elements. Far from a traditional yacht interior, Skat favoured open spaces, fewer pieces of furniture and no heavy woods, though colourful furnishings and original Lichtenstein and Vasarely artworks meant it was far from dull. A stark, militaristic exterior – trailblazing in itself – required a clean yet bold interior design. Marco Zanini created a Bauhaus-inspired interior for 70.7 metre Skat that called for simplicity, so its design eschewed clutter and superfluous elements. Far from a traditional yacht interior, Skat favoured open spaces, fewer pieces of furniture and no heavy woods, though colourful furnishings and original Lichtenstein and Vasarely artworks meant it was far from dull. Despite her name, Ice’s interior is far from cold. The concept was purity and environmentally friendly, and – while not an interior item – she was one of the first yachts to be fitted with Azipods. Terry Disdale’s interior for the 90.1 metre explorer yacht (ex-Air) is a study in modernism, which adheres to balance, clean lines and intentional décor choices. The focus is on modernism and space over luxurious details and only a few different interior materials are used throughout the yacht. 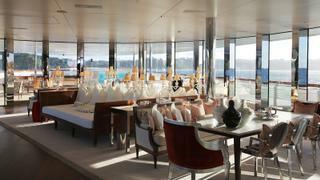 This sets the stage for yacht interiors to serve as a backdrop for the owner’s collection of modern art. Even the bathrooms have an artistic feel, the enormous baths were carved from limestone blocks. Despite her name, Ice’s interior is far from cold. The concept was purity and environmentally friendly, and – while not an interior item – she was one of the first yachts to be fitted with Azipods. Terry Disdale’s interior for the 90.1 metre explorer yacht (ex-Air) is a study in modernism, which adheres to balance, clean lines and intentional décor choices. The focus is on modernism and space over luxurious details and only a few different interior materials are used throughout the yacht. 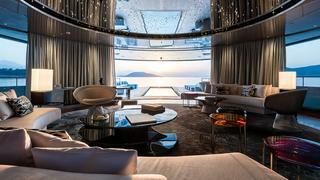 This sets the stage for yacht interiors to serve as a backdrop for the owner’s collection of modern art. Even the bathrooms have an artistic feel, the enormous baths were carved from limestone blocks. Ahead of her time in myriad ways, 88 metre sailing yacht Maltese Falcon has an industrial-chic interior that matches the high-tech appeal of her stunning FalconRig. It was designed by Ken Freivokh around her original owner Tom Perkins’ modern art collection, with heavy use of leather, glass, wood and steel that gave an edgy yet smart atmosphere. Rather than hide the bases of the three masts behind walls and cabinets, Freivokh boldly makes them part of the décor, a technique repeated in other mega-sailers, such as Aquijo. Ahead of her time in myriad ways, 88 metre sailing yacht Maltese Falcon has an industrial-chic interior that matches the high-tech appeal of her stunning FalconRig. It was designed by Ken Freivokh around her original owner Tom Perkins’ modern art collection, with heavy use of leather, glass, wood and steel that gave an edgy yet smart atmosphere. Rather than hide the bases of the three masts behind walls and cabinets, Freivokh boldly makes them part of the décor, a technique repeated in other mega-sailers, such as Aquijo. Most yachts feature works of art, but then you have 53.8 metre Sea Force One, of which the entire interior seems to be an immersive art experience with modern works and light installations at every turn. Even a decade after her launch, she still sets the bar in terms of art-heavy – and certainly unique – interiors. It might not be surprising that she also makes an ultimate party yacht, which was also part of the brief. This bold atmosphere, with lots of lighting and AV effects, heavily influenced future yachts such as Solandge. Most yachts feature works of art, but then you have 53.8 metre Sea Force One, of which the entire interior seems to be an immersive art experience with modern works and light installations at every turn. Even a decade after her launch, she still sets the bar in terms of art-heavy – and certainly unique – interiors. It might not be surprising that she also makes an ultimate party yacht, which was also part of the brief. This bold atmosphere, with lots of lighting and AV effects, heavily influenced future yachts such as Solandge. The unconventional exterior of the ultra-iconic 119 metre Motor Yacht A belies the elegance of the interior, which designer Philippe Starck called “opulent”. While other yachts succeeded by blending interior and exterior spaces, Motor Yacht A clearly divides the two. White furnishings play well off the open-plan design, which makes the limited interior living areas seem more abundant. With A it’s all about visual impact. If there had been no A, there would have been no Predator, no Yas and no Venus. The unconventional exterior of the ultra-iconic 119 metre Motor Yacht A belies the elegance of the interior, which designer Philippe Starck called “opulent”. While other yachts succeeded by blending interior and exterior spaces, Motor Yacht A clearly divides the two. White furnishings play well off the open-plan design, which makes the limited interior living areas seem more abundant. With A it’s all about visual impact. If there had been no A, there would have been no Predator, no Yas and no Venus. This award-winning 46 metre represents the best of the trend in “modern classics” – reimagining the elegance of 1920s yachting with the technology of today and an affection for the long, low profile, fantail stern and external brightwork associated with classic yachts. Is there anything as charming as a fantail stern with overhanging deck above, as witnessed as recently as 2017 with the launch of Soprano? Sycara IV has been sold and renamed Nadan. The interior of Sycara IV, by Ken Freivokh, is a nod to this bygone era, warmed by madrona burl wall panels with inlaid macassar ebony. Family-style cruising yachts of this compact size have been a recurring theme since the 2008’s global financial crisis. This award-winning 46 metre represents the best of the trend in “modern classics” – reimagining the elegance of 1920s yachting with the technology of today and an affection for the long, low profile, fantail stern and external brightwork associated with classic yachts. Is there anything as charming as a fantail stern with overhanging deck above, as witnessed as recently as 2017 with the launch of Soprano?Sycara IV has been sold and renamed Nadan. The interior of Sycara IV, by Ken Freivokh, is a nod to this bygone era, warmed by madrona burl wall panels with inlaid macassar ebony. 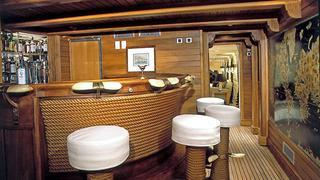 Family-style cruising yachts of this compact size have been a recurring theme since the 2008’s global financial crisis. 56 metre sailing yacht Panthalassa showcased a remarkable interior by Foster & Partners with flowing, highly architecturally inspired shapes and furnishings. She also showcased an abundant use of glass and a showstopper of a central oval staircase that connects all three decks. Perhaps the biggest impact with this interior is that it opened up the builder to working with outside architects, such as the famed Norman Foster, who tugged the GA into new usefulness. 56 metre sailing yacht Panthalassa showcased a remarkable interior by Foster & Partners with flowing, highly architecturally inspired shapes and furnishings. She also showcased an abundant use of glass and a showstopper of a central oval staircase that connects all three decks. Perhaps the biggest impact with this interior is that it opened up the builder to working with outside architects, such as the famed Norman Foster, who tugged the GA into new usefulness. “Make it impressive” was Shahid Khan’s brief for his 95 metre Kismet. Impressive it certainly is, with a dramatic interior by Reymond Langton. A massive staircase leads from the main saloon, replete with piano and opulent bar, to the upper deck, and the atrium is dominated by a magnificent art deco chandelier. Kismet is an icon for what is possible in an over-the-top superyacht interior and a layout based on being able to entertain large groups in style. “Make it impressive” was Shahid Khan’s brief for his 95 metre Kismet. Impressive it certainly is, with a dramatic interior by Reymond Langton. A massive staircase leads from the main saloon, replete with piano and opulent bar, to the upper deck, and the atrium is dominated by a magnificent art deco chandelier. Kismet is an icon for what is possible in an over-the-top superyacht interior and a layout based on being able to entertain large groups in style. Yachting design newcomer CG Design was able to bring fresh eyes to 83.5 metre Savannah, creating an unusual layout with immense dimensions and an open main deck surrounded by sliding curved glass, leading to the pool on the same level. In fact, everything on this boat is curved – except the plumb bow. She’s equally ground-breaking for her cosier spaces, such as the Nemo room, that connects guests to the sea, and for a spectacular catwalk connecting two saloons on her upper deck. Yachting design newcomer CG Design was able to bring fresh eyes to 83.5 metre Savannah, creating an unusual layout with immense dimensions and an open main deck surrounded by sliding curved glass, leading to the pool on the same level. In fact, everything on this boat is curved – except the plumb bow. She’s equally ground-breaking for her cosier spaces, such as the Nemo room, that connects guests to the sea, and for a spectacular catwalk connecting two saloons on her upper deck. While some might still prefer heavy woods or overly luxurious details, the 77.25 metre explorer yacht's interior by Christian Liaigre represents the growing trend of contemporary modernism and support of the sport lover's lifestyle. This "new modern" can be defined by subtle, refined and open areas – and the luxury of space. Curves and masculine, unadorned joinery are in abundance, and Cloudbreak also boasts a winter garden. While some might still prefer heavy woods or overly luxurious details, the 77.25 metre explorer yacht's interior by Christian Liaigre represents the growing trend of contemporary modernism and support of the sport lover's lifestyle. This "new modern" can be defined by subtle, refined and open areas – and the luxury of space. Curves and masculine, unadorned joinery are in abundance, and Cloudbreak also boasts a winter garden.